Splunk is a software that provides you with an engine that helps in monitoring, searching, analyzing, visualizing and which acts on large amounts of data. It is a wide application and it supports and works on versatile technologies. Splunk is an advanced technology which searches log files which are stored in a system. It also helps in operational intelligence. Splunk has many uses and it does not require any complicated databases, connectors or controls. It can also be used as a cloud application which is highly scalable and reliable. Let us see some of the uses of Splunk which are as below. This provides the exact results from the log without much efforts for searching for them. This makes it much more effective. For Splunk to find out the duration on when the application is starting or how much a user is waiting is from the data it receives from a variety of sources. These sources can be any from all kinds of log files, Windows event logs, Syslog, SNMP, to name a few. You gave the facility of looking for data by writing a script and directing it to Splunk. Even after this if you are unable to find what you need you to have Splunk’s App Directory as an add-in that helps in collecting the necessary data. All data that comes can be having vast limits and may have user experiences and application monitoring, agents. This data is monitored at different endpoints and independently of Splunk and sends the data that it collects in Splunk and processes it further. Splunk apps can be data inputs and they also provide dashboards that visualize what Splunk has indexed. Splunk accepts all data immediately after installation. It does not have any fixed schema and takes all data as it is. When it starts searching the data at that time it performs field extraction. Mostly all log formats are recognized automatically and everything else can be specified in configuration files. This helps in bringing flexibility. uses of Splunk can take any kind of data present in the system and create its index. When indexing is done it processes incoming data and prepares it for storage. All data is segregated and streams of characters are created as individual events. There is no backend to manage or any database to set up when Splunk comes into the picture. This makes Splunk available on multiple platforms and can be installed speedily on any software. If one server is not enough another can be added easily and data is distributed across both these servers evenly. This increases the speed with the number of machines that is holding the data. As this is distributed over many environments there is no single point of failure. 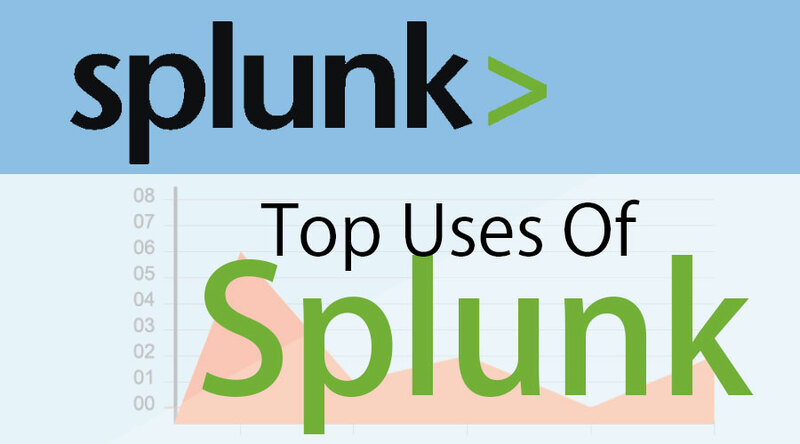 uses of Splunk can generate a variety of reports like graphs, pie charts, bar charts, etc. The tools that it uses to generate these reports are great. From statistics to frequencies to correlations, everything can be captured in a report. Each report has a dashboard and gives the viewer many options for customizing and bringing out the necessary data with the changing timeframes and data sources. In addition to this is also has an alerting mechanism which helps in log management. These alerts are generated when Splunk queries are run and there are alerts and dependencies to be defined. These alerts can be sent over an email, RSS feeds or simply through a script. In today’s world of DevOps, it is sometimes difficult to check the underlying infrastructure and to quickly identify the root cause of issues. uses of Splunk provides visibility for a performance of the system and helps the customers to find problems and discover trends. Monitoring is much easier by looking at the indexes. All logs are generated and stored. With the log files which are stored in Splunk, it is easy to troubleshoot any issue that occurs. Splunk supports many configurations. To figure out which configuration is currently running is difficult. To make this easier there is a tool. This tool can help[ the user detect configuration file issues and see the current configurations that are being used. Btool displays merged on disk configurations and help in troubleshooting files issues or check the values being used by Splunk. A user can monitor servers or Windows infrastructure by uses of Splunk. Performance monitoring covers dashboards for CPU, Memory, Physical Disk and Logical Disk, Network Interface, and System metrics. Each drop down also has text boxes where you can click and enter the required text. For Windows, this app immediately filters the collected metrics and shows entries that match your search. Splunk helps in the creation of different dashboards that help in better management of the system. It gives all different metrics a different dashboard. As a result, the data is segregated and can be managed well. Using the indexing and events data is stored in Splunk and can be used anytime. Whenever it is searched it can be fetched from there logs can be monitored easily. Hence Splunk is the perfect tool to monitor different infrastructure performances, troubleshoot issues, create dashboards, create reports and alerts easily. It is a complete tool for managing any system with all the logs being stored dynamically.